The crew of Trinidad Rig 135 has earned some bragging rights. Earlier this fall, in Panola County, Texas, they completed the longest lateral that Anadarko Petroleum has ever drilled. The well was drilled in the Haynesville Shale formation, which stretches across parts of East Texas, southwest Arkansas and northwest Louisiana. Advancements in directional drilling technology are helping companies access shale formations across the U.S.
Rig 135, like the majority of Trinidad’s rigs, is outfitted with advanced equipment that allows it to drill deeper and longer. This technology, combined with Anadarko’s advanced down-hole tools (such as Measurement-While-Drilling technology), was a key part of reaching the record depth, Gilcreast explained. “Well-maintained and state-of-the-art equipment played a big role both top side and down hole,” he said. 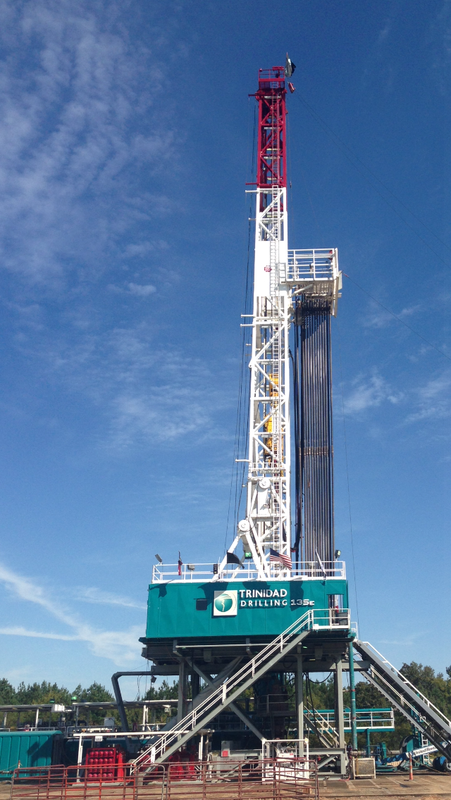 At Trinidad, we pride ourselves on our ability to lead the industry as we find new ways to drill deeper, longer and more challenging wells. Be part of the team that is moving drilling into the future. Apply to join Trinidad Drilling today.